It’s our second week in hell, and the hot debate of the moment is what it means that former Breitbart News chairman Steve Bannon will serve as Donald Trump’s chief strategist. I will tell you what it means: the president is being advised by someone who mobilized an army of racist, sexist cartoon-frog-loving internet trolls. For an alternate view, we can look to Joel Pollak, Breitbart’s senior editor-at-large and in-house counsel, who went on NPR to defend Bannon and accused public radio of being the real racists. Pollak was, of course, ignoring the fact that Yiannopoulos is a longstanding, beloved figure in the loosely clustered collection of Pepe fans that comprises the “alt-right.” And the article he’s referring to isn’t a work of journalism so much as it’s a celebration of Milo’s friends, written for the “establishment conservative.” (There was, for some reason, also no discussion of the fact that Yiannopoulos was permanently banned from Twitter this summer for leading a noxious, racist harassment campaign against the actress Leslie Jones). Inskeep also had questions about a Breitbart story that defends the Confederate flag, and, in the process, criticized President Obama for having Kenyan ancestors and characterized the Civil War as a war over states’ rights, not slavery. Pollak used that question to criticize Code Switch, an NPR program about race, ethnicity and culture. INSKEEP: I want to mention, you know — actually, putting controversial opinions out there is a perfectly fine idea. We’ve had David Duke on this program. But we fact-check. We try to question, we put in context. This particular article goes on to make a string of statements. There’s a reference about President Obama and Kenya. There’s also a statement: “The Confederacy was not a callous conspiracy to enforce slavery, but a patriotic and idealistic cause.” A little bit of research would show that Alexander Stevens, the vice president of the Confederacy, declared the cause was slavery. I mean, why put these things out there? POLLAK: I think that we can talk about individual articles out of the tens of thousands at Breitbart, but, you know, NPR is taxpayer-funded, and has an entire section of its programming, a regular feature, called Code Switch, which from my perspective is a racist program. I’m looking here at the latest article, which aired on NPR, calling the election results “nostalgia for a whiter America.” So NPR has racial and racist programming that I’m required to pay for as a taxpayer. 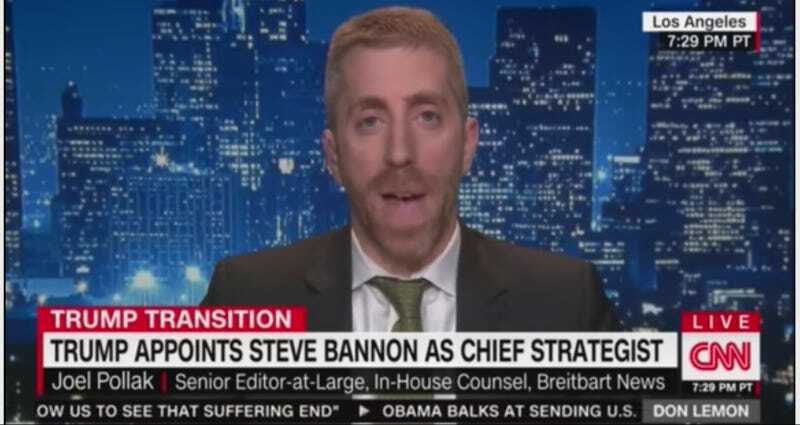 Pollak is having a wonderful time busily defending Bannon on a variety of other platforms, including CNN Tuesday night, and Breitbart, I’m sure, couldn’t be more grateful for the added traffic.